It was 1987. It had been almost a year since I graduated from college, and I had yet to land a job. I was beginning to get tired of going around offices in Makati, Ortigas, and Manila. I told my Nanay that my mug is already all over Metro Manila from all the resumes that I had been giving around, so I wouldn’t be surprised if people would start recognizing me in the streets. So my gracious tita, who owned a small furniture shop in Paranaque, asked me if I would like to work for one of her friends as an office clerk in their garments silkscreen printing business. I told myself I could use a little money to fund my job hunting, so I accepted the offer. 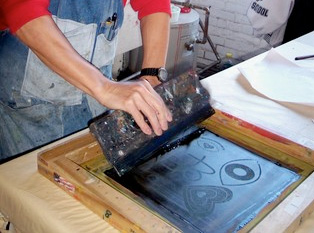 It was, anyhow, just temporary and the thought of working in a garment printing environment stimulated my curiousity. Owners Mr. and Mrs. Barzaga were very simple folks. Both under-educated, they owned and managed the small factory that designed and printed on various garment materials. They were both hands-on with the business, with Mr. Barzaga himself getting involved in the silkscreen operation line. They had reputable clients like Puerto Azul, Pepe Jeans, and Hello Dolly. They had, as far as I can remember, three children whom they were able to send to decent schools from their business earnings. Mr. Barzaga wore a goatee that went well with his chinky eyes to give him a stern look. The wife was actually the strict one, easy to shout at erring staff from time to time. Almost every employee feared or avoided her wrath. Except for the designer and me, the rest of the staff were also under-educated. Both husband and wife are, in reality, kind and understanding. The wife, in particular, is more approachable than what everybody else thinks. Thinking about it now, the couple’s strict management style was a defense mechanism to compensate for their inability to read and write. I was the only one working in the office. I have a degree in Literature, but my work in that factory involved all possible functions — from writing correspondence to accounting and auditing! I always thought that taking Literature in college can save me from numbers, although I’m not exactly stupid in math. I would also function as the liaison officer especially when dealing with their foreign clients. Imagine that. Prior to my employment in that factory, the couple had several others working for them as all-around office clerk. Unfortunately, the Barzagas got duped financially several times for obvious reasons. Perhaps because I was recommended to them by their friend, they were glad that I came their way and immediately trusted me with all of the company’s money. The couple trusted me so much that Mrs. Barzaga didn’t find it necessary anymore to get herself involved in the business. So she enrolled herself to school and went with her kids to class everyday. She looked adorable in her uniform — plaid skirt, white cotton blouse, black standard shoes, and white socks that went just above the ankles. She had a stroller that carried her big, square schoolbag. I remembered her beaming at me on her way to her first day at school. It was a precious sight. I realize now that in my lifetime, I had touched the life of at least one person, and may even have helped make a difference in the lives of the rest of the Barzaga family. The day I left that factory was perhaps the most heartbreaking day for me as an employee. I found another job that paid more, and so it was time for me to go. Mrs. Barzaga begged me to stay and offered to give me another raise. In the best and simplest way I know, I tried to explain to her why I had to resign. Mr. Barzaga understood, wished me well, and thanked me for the work I’ve done for them. Still, it’s never easy to break these people’s hearts, especially because I know how hard they have worked to keep their business moving. I don’t know where they are now, or if their business ever prospered. I still wonder if Mrs. Barzaga ever reached college and earned a degree. But they are good, hardworking people. I would like to think that they are now very successful and are helping a lot of equally good and hardworking people. That’s how this story should end. Happily. Hopefully. Nakakatuwa balikan mga suweldo sa first job natin. Ako din karamput na P2,700 a month as an auditor sa SGV back in 1988 🙂 (yes, 1988 unang work ko kasi 5 years accountancy sa UP) . Pero teka bakit ikaw 1987 was almost a year na since you graduated from college? Maaga ka nakatapos nung 1986? Third year pa lang dapat tayo nun, di ba?